Today's Children's Picture e-Book Review is Thank You Meiling, written by Linda Talley and illustrated by Itoko Maeno, for Ages 3-9. There was a hushed feeling as I read this book, Thank You Meiling, to three of my children, that's how cozy we all felt as we followed Meiling throughout her day. We enjoyed the delightful illustrations and the gentle way Meiling learned to say Please and Thank You, and to think of other people before herself. Some manners books hit you over the head with manners. This book revealed manners in a way that was so endearing. I HIGHLY recommend this book. By the way, I read this as a children's picture e-book, and the illustrations were still vivid and enjoyable. Remember to double tap on the device if you want the picture to enlarge. Today's Children's Picture e-Book Review is If Dogs Could Do Chores, written by Jacquelyn Smith-Induni and illustrated by Melanie Stephens, for Ages 2-9. If Dogs Could Do Chores is a children's picture e-book written by an EIGHT year old. And it is worth the read! This book's concept is funny: An 8 year old girl imagines dogs doing her chores, and the result looks hilarious. There's a poodle who's cooking dinner and a dog in a pink frilly apron sweeping the front step. My favorite is the elegant long-haired dog cleaning up her "mess." The last page shows the girl relaxing in a hammock with a dog bringing her lemonade (and winking at the reader), since she gets to relax if her chores are done by dogs. I do not give 5 stars lightly, but this book is a delightful read-aloud with detailed illustrations that made me and my children (age 4, 7, and 10) smile. Disclaimer: I give an independent, fair and honest review of this book, which I received for free as a reviewer for The Kindle Book Review. I am not associated with the author or Amazon. Today a post I wrote for Momma Says Read went live. Do you want to know why I write? What led me to it? Then check out my article here. Momma Says Read is an online community dedicated to connecting readers with new and wonderful books! Connecting books and people? Since I love people and books, I think any matchmaking between the two should be encouraged! 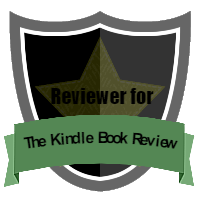 I'm on The Kindle Book Review team! 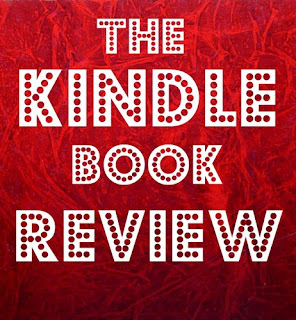 As an author, I found the links on Author Resources of The Kindle Book Review very helpful. Especially as I prepared a KDP Amazon promotion with The Snake Who Wanted To Be A Horse. Then I discovered the Get Reviewed page which lists book reviewers. There wasn't a reviewer who specialized in Children's Picture Books, so I applied. And was accepted! You can see me on that Get Reviewed page. If you want to have your book reviewed, then follow the precise instructions and make sure you only email it to one reviewer at a time. A reviewer for Kindle Book Review posts their review on Amazon, and because there's so many quality and helpful reviews from that one account, these reviews have more weight than an everyday reviewer. You need to understand how reviewing works with Amazon in order to understand what I mean. How does Amazon reviewing work? Anyone who has an Amazon account can review the books they buy. After a certain amount of reviews that are voted "helpful" (I'll explain that in a minute) then anyon can reach a point where they can review any book, even if it wasn't bought through Amazon. How are reviews voted helpful? At the bottom of each review there's a question: Did you find this review helpful? Yes or No. When you click Yes, then that reviewer gains "status." By status, I mean that his/her reviews are given more weight by Amazon, because other people have found them helpful. The more helpful votes, the more weight the reviewer is given. In fact, some reviewers become Top Amazon Reviewers. These are the reviewers that we, as authors, want to review our books! Here's a guide that goes more in depth for about contacting those top reviewers. Keep in mind that the very top reviewers receive a great deal of review requests, so you might have better luck with reviewers lower down on the list. Also, my advice is to choose a reviewer who reviews books in your genre. You'll have better luck getting a review. Today's Children's Picture e-Book Review is Ug The Little Stone Age Boy, by Barry J. McDonald, for Ages 3-9. Bug is jealous and he plays a trick on Ug that gets Ug into trouble. Will he get caught? Will he say sorry? This children's picture e-book has adorable illustrations, and I don't mind that the illustrator used the same backgrounds and just set the characters in (probably created on Adobe Illustrator, which provides that kind of flexibility). However, I do feel short-changed when he used the exact same illustrations on two pages, TWICE! That's what kept this book from a five star rating. The illustrations were excellent enough, but McDonald cheated a little. The plot is simple, and set to an uncomplicated verse, but when I read it aloud to my 4 and 7 year olds, we liked it the rhythm of the words and the story. My 4 year old especially loved the Mammoth and the Triceratops. 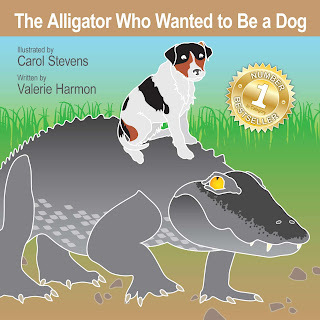 Today the third book in our WantsToBe children's picture book series, The Alligator Who Wanted To Be A Dog, hit the #1 Best Seller list (within its category on Amazon)! When we get to add the gold #1 Best Seller badge, well, it feels good. Real good. THANK YOU to all of you who enjoy our books and have sent Snorse, Ellabee and Allidog to #1 Best Seller status. It is a compliment of the highest order!! Dog: "They told me I could be anything, so I became a Doberman"
A friend of mine, S R., posted this photo on my WantsToBe Facebook page because it reminded her of my books. LOL! If Alligator (the main character in my latest book The Alligator Who Wanted To Be A Dog, had met this dog first, the ending might be more unusual than it is now. Allidog on stilts? Credits: I believe this photo (without the meme) comes from this website.